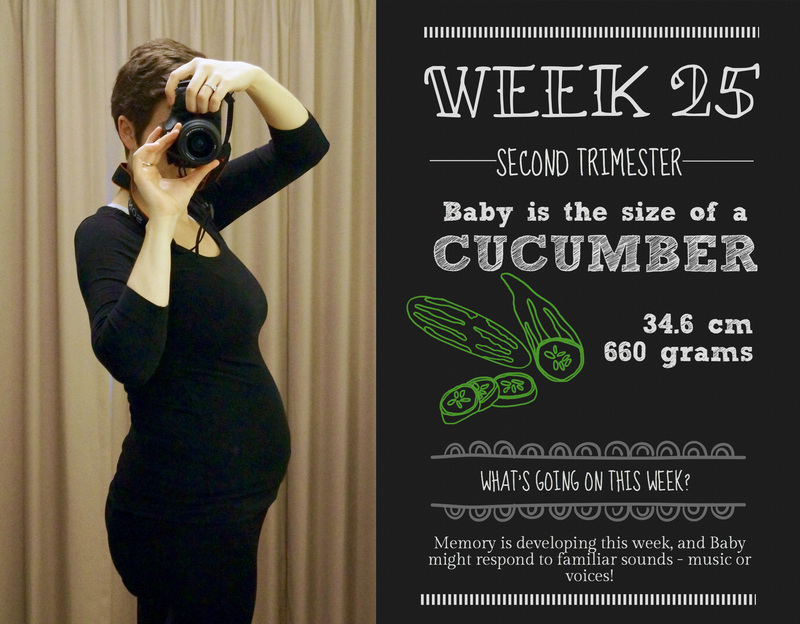 Baby: A cucumber – one of the big ones! Ironic that as this week is about more weight going on for Grub, the vegetable reference is a skinny little bean pole. What I’m cooking: Remember me, baby! This week, Grub is starting to form primitive memories, and will respond to familiar sounds – music and voices. She is also looking much more opaque thanks to the fat being laid down under her skin – not sure if I could handle a transparent baby! Main symptom: The common cold, yet again. As an added bonus, I’m starting to develop haemorrhoids (sorry to be graphic), which are absolutely no fun at all, and apparently enormously common in pregnancy. I’ve seriously upped my fibre intake to try to lessen the pain, because bloody hell it hurts at the moment! What’s on this week: The next hospital appointment, this time with a midwife again, and I’m hoping to make it back to yoga after a hiatus due to Mr Nester’s hospital stay. Oh hello there again! Lovely to catch up with you all, finally! We’re at the end of 25 weeks now, running a bit late again this week, mainly because I’ve been floored by a chest infection. For the entire week. This is the interesting part of pregnancy – symptoms-wise, I’ve been very lucky in not having many bad ones, but the lower immune system, combined with the hazard of being a teacher in winter, and my ever-reducing stamina has resulted in me being completely whacked whenever I pick up the bug that’s going around. I have been coughing non-stop since last Saturday, and had the pleasure of coughing up blood on Thursday and Friday (fret not, the GP has said that my lungs were just very irritated from all the coughing). I also haven’t been able to breathe through my nose for the week, so generally I’ve just been disgusting. Mr Nester, you’ll be pleased to hear, has been going from strength to strength this past week, and is very much returning to his old self. He’s still working on his stamina throughout the day as well, so we’ve made a fine pair this week, both napping in the afternoons and spending the rest of the day on the couch, under the doona (duvet for the non-Aussies!). I also had another midwife appointment this week, which was again fantastic. There was a bit of a miscommunication with the location of the appointment, which led me to wander around the hospital a little, completely lost, and eventually present myself at Emergency, as I couldn’t find any other open enquiry spots. Thankfully they pointed me in the right direction, and one of the gorgeous midwives took me in for my appointment straight away. Once again, it was a great experience – I’m so glad I picked the midwife program at the hospital, because they have been a dream. After experiencing the somewhat clipped obstetrician at the last appointment, it was lovely to return to someone who seemed to care about how I was feeling and to let me know the details of what they were looking at. The midwife also took the time to look through the 20 week scan (which the OB didn’t have at the last appointment), let me know that everything looked great, and also that I had an anterior placenta (the placenta is at the front of the uterus, instead of the back)! I had no idea, especially as this usually means that it’s harder to feel the baby kick – no such issue here! Grub must be kicking like crazy if I can still feel it so strongly, although I have noticed this week that I feel the kicks a lot more strongly on the side than the front. Other news from the midwife – apparently I’ve been sitting up incorrectly for the last couple of months, which isn’t helping my back and my chest – I’ve developed this sort of popping feeling in my ribs when I sit up from lying down, and the midwife has said that this is because I’m sitting straight up, instead of rolling to my side and pushing myself up with my arms. The problem is that I no longer have the stomach muscles to support this movement (especially as they’re currently separating down the middle), and so all the strain is going to my lower back and chest. I’m trying to be more careful now, although I keep forgetting. The midwife (I’ve completely forgotten her name, sorry lovely midwife!) also measured my fundal height, which is the first time I’ve had that happen. Basically it means she pokes me down near the baby-maker, to find the top of my pubic bone (god I felt it when she hit it! ), and measures from there up to the top of my uterus. The distance should correspond to the number of weeks I am – and it was exactly 25cm, so I’m bang on at the moment! I’ve also been booked in to do my glucose test, to check for gestational diabetes. I’ve heard from some US preggo ladies that the first test is a 1hr, and if you fail this you have to go on to the 3 hour test. Unfortunately for me, Australia goes straight to a 2 hour test. So I have to have a blood test, drink some horrible sugary concoction, wait an hour, have another blood test, wait another hour, and have a third blood test at the end of this. This has been booked in for 2 weeks’ time, and I assume I’ll get the results pretty quickly. I’ve also doubled up on this appointment with my next midwife appointment, so it’ll be a big day of hospital fun! This week my weight has dropped by over a kilo, due to my incessant coughing and complete lack of appetite. So this weekend’s task is to eat like a crazy person, so my little Miss Grub has more cushioning again. She’s been so well behaved with all my coughing and spluttering, I’m growing more fond of her by the minute. I’m going to be completely mad for her by the time she’s born! If you find a magical cure for hemorrhoids, please let us know. I’m 30 weeks and it’s torturous! I’m going to do a post on it in the coming weeks because I feel it should be discussed more. So far Metameucil is helping, but it’s not perfect. I’m thinking of ramping it up to a double dose, and upping my water intake. I agree about discussing it – it’s bloody awful (literally)! I have a cream which relieves the pain somewhat. But doesn’t take down the swelling. My fibre and water intake is pretty high so I think this is just a serious downside of carrying baby so low!